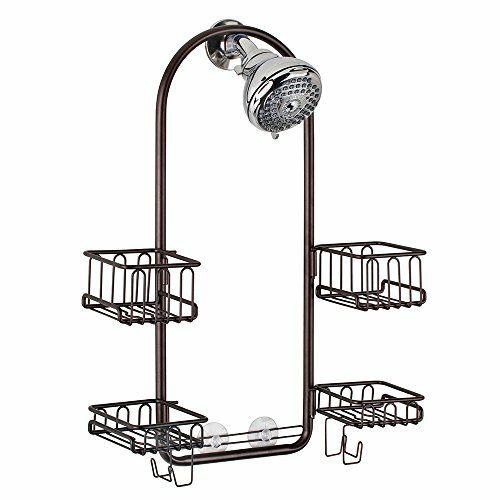 EXPANDABLE CADDY: Baskets swing out to accommodate a handheld shower head and tall bottles. VERSATILE STORAGE: Steel caddy with rustproof bronze coating - 4 adjustable shelves with hooks. QUICK TO HANG: Non-slip shower head clip and strong plastic suction cups keep bathroom caddy secure. PERFECT FIT: Organizer caddy with easy-pour holders for large bottles - measures 5.25" x 9" x 21".